When Sarah Allen first arrived at Quinnipiac she was known as both a great passer and a great scorer. 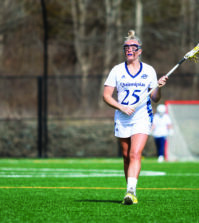 Netting a combined 116 goals and dishing out 85 assists and in her junior and senior seasons at Glastonbury High School, Allen was the all-around talent that women’s lacrosse head coach Danie Caro wanted. Caro knew, however, that Allen would have to adjust her game in order to fit into the overall team system. Elite would be one way to describe it, record setting would be another. In her junior campaign with the Bobcats last season, she had 64 assists in only 15 games. At 4.27 assists-per-game she led the nation and set the NCAA Division I record. The prior record was 4.17 assists-per-game, which was set by Brown University’s Lauren Becker in 1986. This year is an entirely different story. In only 12 games so far, Allen has developed the scoring touch that Caro knew she was capable of. 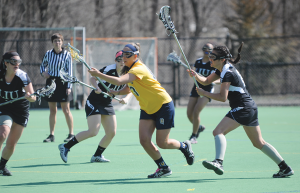 While her excellent level of passing remains a constant, 30 assists so far, she has added 15 goals for Quinnipiac. Allen has also taken on another special responsibility within the team this year. Due to her success and hard work she has become a leader and a mentor for the younger players to look up to. Perhaps opportunity to score more has to do with the fact that Allen has been forced to become a centerpiece of Quinnipiac’s offense. Because of her experience, she is able to get her teammates settled and run the system that was designed. She may not be setting a new assist mark this season, but the senior attacker knows that her ability to adapt to the team’s necessities is key. Still, she remains unselfish when talking about how she has made the recent transformation into more of a goal-scorer. Quinnipiac has started off the season at 5-7 overall and 3-2 in the Northeast Conference. It has recently gotten back to its winning ways, however, with a 20-11 victory over conference foe LIU Brooklyn. Allen finished with a career-record nine points in the victory, with four goals and five assists. 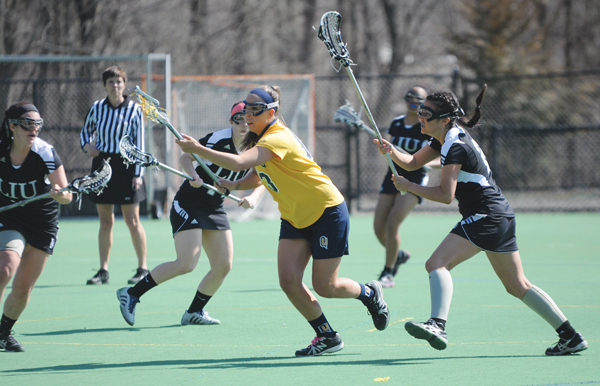 Then on Sunday, Allen made history in Quinnipiac’s 13-7 win over Wagner. After scoring midway through the second half, Allen tied the Quinnipiac all-time scoring record of 175 points. Later in the game, Allen moved into sole possession of first place, picking up an assist with four minutes left. The career total of 176 points propels her over Katie Latonick class of 2010. Heading into the end of their season, both Allen and Caro know that they must continue to grow as a team in order to reach their ultimate goal. Caro said that the team needs to play the style it wishes to for the team to make it far in the conference playoffs. For Allen individually, perhaps the biggest way she can do that is by continuing to be the selfless and effective player she has always been.